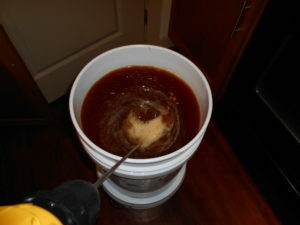 A bochet is a type of mead that is made by first cooking the honey until it is caramelized. The process of burning or cooking the honey darkens and thickens it significantly. The longer it is cooked, the darker the honey gets and the more intense the new flavors become. The honey takes on a significantly more toffee or caramel flavor. This is one mead you wouldn’t want to use a special honey varietal in, as the cooking will completely overpower it. Many meadmakers don’t feel bad about using a cheaper store bought honey for these, as all the flavor comes from the process. Initial color, medium length cook, longer length cook color comparison. The mead that results from this process will be a dark amber color and has a very deep and complex flavor. However, this method tends to require a lot of aging time in order to bring out its full potential. Especially since this style tends to forgo any additional flavorings. While some people will add fruit or spices to their bochets, there are many purists that prefer to keep these as a traditional. For this reason, be sure to have extra nutrients during your ferment, as there will be no fruit to assist with nutrients for the yeast to make use of, and they will already have their work cut out for them with this thicker, dense honey to chew through. The process of cooking the honey requires a fair amount of time and attention, as well as care. Note that nearly boiling honey needs to be treated with caution. If it spatters or spills and gets on you, it will cling to you and continue burning. 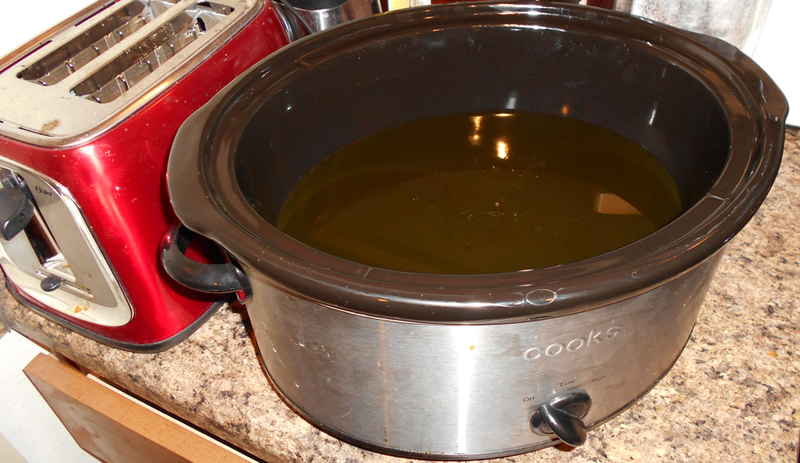 Also, note: you will need a very large pot to cook your honey in. Honey likes to expand a lot – roughly double its volume – when it is being heated. There’s actually two methods available to us to caramelize. The first is in a pot on the stove. Cooking the honey this way will take over an hour of nearly constant stirring, so make sure to block out a significant amount of time. You can gauge how far along into the process you get with how dark the honey has gotten. I put a drip on a card at the beginning, partway in, and then after I decided to add a big more time to it to compare the differences. The second method of caramelizing is a bit easier, and the one I used, although it takes significantly longer. You can actually do this in a crock-pot. 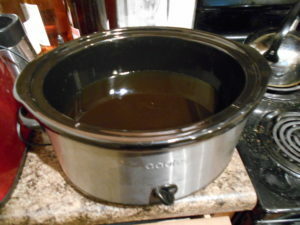 I filled a 1.25 gallon crock-pot roughly ⅓ full of honey and then cooked it on low. You won’t see much activity until after hour 3. Hour 4-5 is when the darkening really begins to happen After that point, the timing is up to you, but you should increase the frequency of how often you check the honey’s progress. I would advise against leaving this unattended, or running it overnight while you sleep. Even at ⅓ full, and with the lid on, After hour 4, I had the honey expand enough to somehow get spattering outside of the lid and onto the floor. I stopped mine after 5 hours, but the next day decided to run it for another 2 to continue darkening it slightly. A lot of that second runs’ time was spent getting the honey up to the temp where it could darken though. Make sure to scrape along the sides on occasion to make sure the honey is heating evenly, and it’s not just crystallizing chunks on the side. The best part of making a bochet is the smell. My place smelled like delicious honey/toffee for a solid two weeks after doing this. You’d eventually get used to it, then re enter the place later and get hit with that smell again. After your honey is the desired color, you’ll have to move it to your fermenting vessel. Then add in your water, and mix thoroughly It will be quite thick, so help your yeast out and make it as homogeneous as you can. Remember the nutrients. Mine had a slow start, as it had a pretty high original gravity. I didn’t see airlock activity until 2 days after pitching the yeast. Even now it is not a super vigorous fermentation like fruit tends to be. Mixing it, the must had an appearance of thick chocolate milk.The kind that Augustus Gloop tried to go swimming in. I’m really excited to see how this one turns out. I have 4 gallons on its way. I decided to do a slightly larger batch for this one than my 1 gallon experimental brews. This is a 4 gallon recipe. Water to fill to 4 gallons. Make sure to mix this one thoroughly and frequently in the beginning stages. You can tend to get away with being less attentive with other meads, especially with fruit additives. But this one requires some attention. The thickness of the honey after caramelizing made it difficult to dissolve fully. On top of that, the initial bubbling from the fermentation caused it to push up some of that viscous liquid and form a rigid layer on top of the must. This caused to to look like the fermentation hadn’t started yet, if you were just checking for airlock activity. It could also cause a buildup underneath the surface that could push it up and out of the airlock if left unbroken. 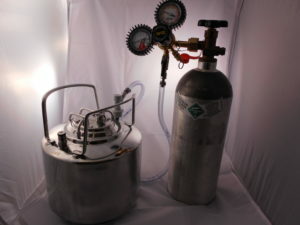 It is also good practice to keep this one aerated in the beginning, as this will assist the yeast with their reproduction. Given the lack of nutrients within the mead itself (but you should be adding some), the yeast will need all the assistance they can get. You don’t want to stress them too much with this environment, as that can lead to some off flavors. If their metabolism isn’t working in the most efficient manner, they may not be processing the sugars into the kind of alcohol we want.